Vinyasa is a breath initiated practice that connects every action of our life with the intention of moving towards what is most important to us. In Vinyasa each movement is synchronized to a breath so you move seamlessly. The key is to focus on how you inhale and exhale as you move from one posture to the next. In this style, you are not “throwing your body around” but bringing consciousness to each movement in each moment. This is a real beauty you can experience from Vinyasa classes with Rebecca. Rebecca’s Yoga and Storytelling classes, for kids aged 7-11, begin with mindful breath work, calming the mind and the body. They then move through a gentle warm-up, preparing the body for the playful practice of a variety of yoga poses. Every class culminates in a shared story-telling session, where children blend the poses they have learned whilst using their imaginations creatively! Finally, the classes end with a cosy, calm relaxation and a positive affirmation to close the practice. Vinyasa is a powerful form of yoga that works on mind and body to give everyone a full body experience. It brings both physical and mental benefits. 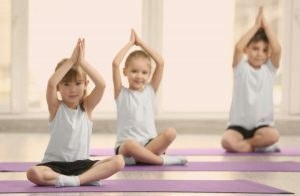 In Vinyasa each movement is synchronized to a breath and these breathing exercises teach children how to properly relax. Stress levels are naturally reduced and healthy hormones are released. Practicing yoga poses builds strength and helps to maintain a healthy weight. Balancing poses promote coordination, stimulate calmness, and teach us how to quiet the mind. They help to manage everyday stress and overstimulation by distractions such as computer games, TV shows, mobile phones and other electronic devices. Balancing poses improve concentration levels. For those children who struggle with focusing their attention, yoga can increase responsiveness. Yoga sessions give them a great opportunity to express themselves, helping to boost their confidence, be more creative and promoting a positive self-image. Rebecca, our yoga instructor is a Vinyasa Flow trained teacher. Her true passion for Yoga was born during her travels in Indonesia, where she fell in love with both the physical and philosophical practice of Yoga. Her playful, creative classes which blend joyful movement with mindful stillness.